European law enforcement in Germany, France, and Belgium are currently taking measures to prosecute the terrorists responsible for the Iranian regime’s failed attempt to attack the annual gathering of the Iranian opposition movement, supporters of MEK in Paris on June 30th. 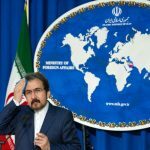 The regime and its officials have responded by using its state-run media to complain about the “unfairness” of the arrest of their agents, particularly Assadollah Assadi, a regime diplomat in Austria and the mastermind of the foiled terrorist attack. The regime has gone so far as to blame the MEK for the arrests. A recent op-ed in the state newspaper Keyhan, a well-known mouthpiece for Supreme Leader Ali Khamenei, griped that “the dignity of the Iranian passport had been sullied”. This is in reference to Assadi’s diplomatic immunity, which was canceled following his arrest for espionage and conspiracy to commit murder by the German Prosecutor’s Office. The paper further wrote, “This arrest has no basis.” The regime seems determined to deny the evidence against its operatives, despite the investigations currently taking place by authorities in three European countries against Assadi and those charged with carrying out his orders. One regime MP, Gholam Ali Jafarzadeh, blamed the MEK for the situation, saying that the MEK is plotting to destroy relations between Europe and the Iranian regime. He advised regime President Hassan Rouhani to “closely monitor the events and react firmly.” He also stated the need for the regime to train its diplomats to avoid “stepping in the traps of the enemy.” This would appear to be an admonishment to the regime’s foreign ministry that they have not been effective in training its diplomats in terrorist activities and evading detection. Regime officials recycled some old strategies from its playbook as well, claiming that the MEK staged the attack itself. They reasoned that no government would give its diplomats explosives to carry out a terrorist attack in a foreign country. The regime has used this line before when it has been caught carrying out terrorist attacks in Europe and other countries. This lie by the regime rings particularly false in its hypocrisy and only serves to lessen the credibility of their other already dubious claims. It also shows how much they fear the MEK. The fallout from the failed terrorist plot has also intensified the in-fighting among the various factions in the regime. Those authorities closely tied to Khamenei are demanding to know why Rouhani and his government have not managed to secure the extradition of Assadi from Germany custody. As always, media in Iran only shows the tip of the iceberg. The arrest of Assadi and the other terrorists responsible for the failed attack on the NCRI gathering in Paris is causing upheaval in Tehran, and the full extent has yet to be seen. 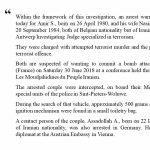 On Monday, July 2nd, Belgian authorities confirmed they arrested a husband and wife of Iranian origin in connection with a plot to bomb the Free Iran rally held in France. 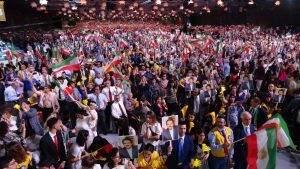 The People’s Mujahedin Organisation of Iran (MEK) and the National Council of Resistance of Iran (NCRI), two Iranian opposition groups in exile, held their annual gathering in Villepinte, Paris, with critics of the Iranian regime attending from all corners of the world. 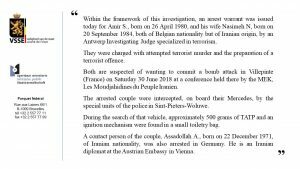 As well as the couple in Belgium, German authorities arrested an Iranian diplomat, named as Assadollah Assadi, at the Austrian Embassy in connection with the plot. A fourth person was arrested in France. The French authorities are in the process of extraditing the suspect to Belgium. It is reported that the diplomat provided the couple, Amir S. and Nasimeh N., with 500g of triacetone triperoxide (TATP) and a mechanism to ignite the homemade explosive. Belgian authorities found the bomb in a “small toiletry bag”. The timing of the plot was unfortunate for the Iranian regime. President Hassan Rouhani embarked on a European visit, beginning in Switzerland on July 3rd, in an attempt to court European governments and persuade them to salvage the Iran nuclear deal. As major European law enforcement agencies, the VSSE, the Antwerp Federal Judicial Police, DOVO, the French DGSI, and German Judicial authorities, are unraveling the full scope of the plot, Rouhani may find his charm offensive undermined. Unsurprisingly, the regime immediately began to distance itself from the attacks. 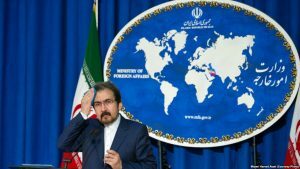 The regime’s Foreign Minister stated that the plot was a deliberate attempt to undermine Iran’s relationship with European Nations. A spokesperson for the ministry strived to deflect accusations by laying the blame on the MEK. He alleged the couple were members of the MEK. The French government dismissed the regime’s denial. It will proceed with the extradition of the suspect in French custody. However, a French diplomat confirmed that a full investigation was in process. The Iranian Foreign Ministry’s stance would be more believable if this was the first time Iranian state agents had been arrested for operating in Europe. But it is not. As recently as January, German police raided 10 apartments in search of Iranian “state spies”. US Secretary of State Mike Pompeo also accused the regime’s Quds Forces of carrying out “covert assassinations in the heart of Europe”, in May. In the wake of the foiled attack, the Iranian regime has intensified its campaign of vilification aimed at the MEK. The Iranian state-run media and their proxies abroad have repeatedly pedaled the notion that the plot was orchestrated by the MEK to undermine the regime’s relations with Europe. Some outlets have asserted that the 500g of TATP found in the possession of the Belgian couple was not intended to kill, only to create a “sound bomb” and generate a media storm. The perpetrators behind these falsehoods are familiar faces. Darius Bazargan, who broke the “news” that the plot was a “MEK inside job” is the producer of a recent MSNBC segment which was lambasted for spreading misinformation about the MEK place of residence in exile in Albania. Similarly, the Guardian journalist Saeed Kamali Dehghan – an infamous regime advocate – regurgitated the regime’s narrative, pointing the finger at the MEK. The regime can use its mouthpieces all it wants; it is not having the desired effect. The narrative is falling on deaf ears. Representatives from France and the US have shown they will not permit the puppet masters in Tehran to play them. The case has drawn attention to Iran’s European spy network. A network that major European nations will be keen to eradicate. With any luck, this will be the wakeup call Europe needs. To remove Rouhani’s tentacles, you must cut off the head. Regime change is the only way to end Iran’s terrorist financing and destabilizing efforts abroad. The first step towards prising Iran out of the mullahs’ grip is to endorse American sanctions. Without sanctions, the regime will remain free to spread its networks across Europe, and next time, the plot may not be foiled in time. On Saturday, the day of the rally, a couple was arrested by Belgian authorities with explosives and a detonator, which they were planning to use to bomb the NCRI gathering in Villepinte, outside of Paris. The couple had Belgian citizenship and claimed to be supporters of the MEK. According to the Belgian VTM news, as cited on the NCRI’s website, those explosives, if combined with a nail bomb, could have caused hundreds of casualties. An Iranian diplomat from the regime’s Austrian Embassy in Vienna was also arrested in connection with the planned terrorist attack. According to the Belgian Public Prosecutor’s Office, he was arrested in Germany as a contact person to the terrorists. “All the participants at the “Free Iran 2018 – The Alternative” rally in Paris on June 30, appreciate and admire the fine work of law enforcement particularly in Belgium and France in arresting the terrorists who, according to the Belgian Federal Prosecutor’s office, were planning an attack on the gathering supporting freedom from the theocratic oppressive regime in Iran. 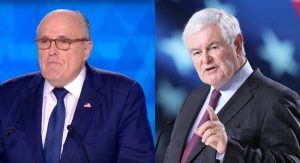 Giuliani was also present and spoke at the annual Grand Gathering of the National Council of Resistance of Iran (NCRI) on June 30th, where he gave an impassioned speech in support of the Iranian Resistance movement, which includes the MEK. In his speech, Giuliani said, “Freedom is around the corner” for the Iranian people. 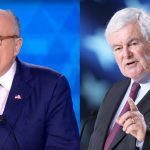 Rudolph Giuliani has been one of the biggest supporters of the Iranian Resistance Movement and the NCRI and MEK, and has spoken at several past Grand Gatherings. His statement underlies the growing acknowledgment of the international community that the Iranian regime has weakened under the pressure of the Resistance Movement, as well as the reinstatement of sanctions due to the decision by the United States to withdraw from the JCPOA. Newt Gingrich who was one of the key speakers at the NCRI gathering also expressed his concerns in a tweet, emphasizing on the fact that the cowardish plot “shows how frightened the dictatorship is of the free Iran movement”. Iranian dictatorship plot to bomb the Free Iran rally in Paris last weekend (stopped by combined Belgian-French-German police effort)involving an Iranian government agent and Iranian terrorists living in Europe shows how frightened the dictatorship is of the Free Iran movement. Former Speaker of the United States House of Representatives, voiced similar sentiments, in his speech at the gathering, acknowledging the regime’s weakness and calling for an end to the policy of appeasement. In his speech, he also urged the resistance, which includes the MEK, to strike now to bring down the regime, and encouraged the international community to support the Iranian people by writing their elected leader and tweeting support of the ongoing protests in Iran.